While the Spanish enterprise in America is relatively well known to the English-reading public, the Portuguese tropical empire in Brazil has remained until recently an unknown world. 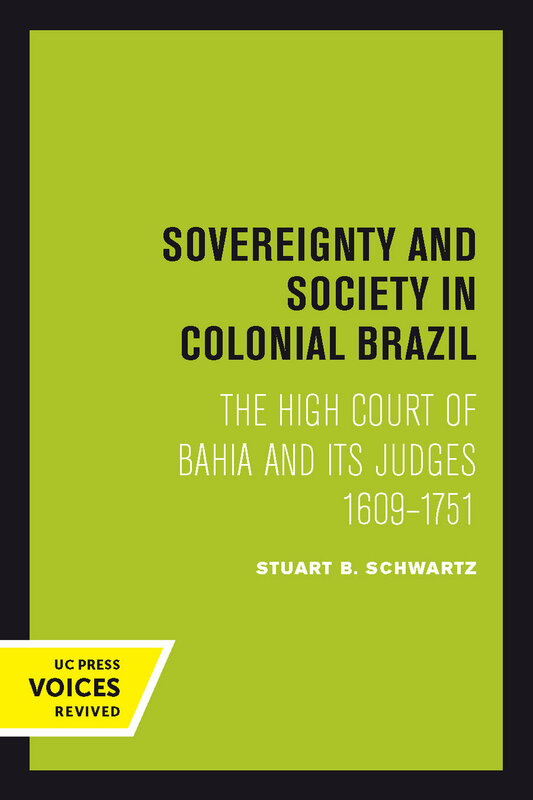 In Sovereignty and Society, Stuart B. Schwartz contributes to our understanding of the Brazilian past by providing for the first time a detailed study of the judicial bureaucracy that formed the framework on the colonial regime. This volume describes the process by which royal administrators maintained control and the techniques used by the whole Brazilian elite to guard its interest. At the core of the book is the previously unstudied Relação or High Court of Bahia, the supreme tribunal in colonial Brazil and an institution with broad administrative and political powers. Presided over by the governor-general or viceroy, the High Court stood at the apex of the colonial administrative structure and symbolized royal sovereignty. The author examines the origins, functions, conflicts, and history of the Relação, relying on little-used manuscript sources in over twenty-five archives and libraries in Brazil, Portugal, Spain, and England as well as the whole range of secondary literature. Of particular interest is the departure from traditional administrative history by emphasis on the people rather than the office of the Portuguese imperial bureaucracy. The bureaucrat-judges of the High Court are at the center of the study, and by a careful analysis of the personal and professional careers of these magistrates, the author demonstrates the utility of a human relations approach to the study of historical polities. He shows how the goals of the crown, the aspirations of the magistrates, and the interests of the Brazilian sugar planter elite were expressed and reconciled and how royal officials and the planters became linked by kinship and interest in a union of wealth and power. Finally, he argues that the penetration of such primary relations in the formal structure of a bureaucratic empire helps to explain the resiliency and the longevity of Portuguese rule in Brazil. The approach and findings of this book will interest not only those seeking a deeper understanding of the Brazilian past, but also historians, sociologists, and political scientists concerned with colonial regimes and bureaucratic polities in general. Stuart B. Schwartz is George Burton Adams Professor of History at Yale University. His books include All Can Be Saved: Religious Tolerance and Salvation in the Iberian Atlantic World, Victors and Vanquished: Spanish and Nahua Views of the Conquest of Mexico, The Cambridge History of the Native Peoples of the Americas: South America, Implicit Understandings, Slaves, Peasants, and Rebels, and Sugar Plantations in the Formation of Brazilian Society. Professor Schwartz specializes in the history of colonial Latin America, especially Brazil, and the history of early modern expansion.